Drum Corps International is currently accepting registrations for the 2014 edition of its Ambassador program, a grassroots effort that engages high school and college students to help spread the word about the DCI Summer Tour and other drum corps events and activities. More than 2,500 students were involved in the program in 2013, the second year it was organized, and DCI Director of Business Development John DeNovi says he hopes to see that number grow in 2014. "We couldn't be happier to see the DCI Ambassador program continue to grow and thrive," DeNovi said. "We saw more growth in our group ticket sales program last year and in attendance at the DCI World Championship Finals, no doubt thanks in part to the dedicated efforts of the Ambassadors." The Ambassador program is free to join, and those interested can register online to be a part of it. At the end of March, DCI will mail Ambassadors an exclusive packet of supplies and information including posters, flyers, decals and more. Several of these items can be customized to a specific DCI Tour event or series of events near the Ambassador's hometown. Ambassadors are asked to use those materials to reach out to their fellow students, educators, band parents and others in person and online to share excitement for and information about DCI Tour events in their area. 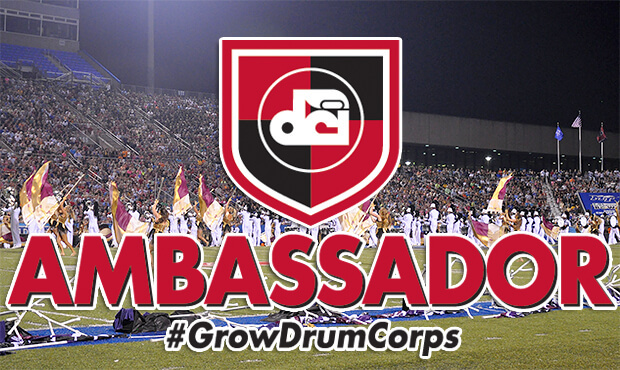 Using the hashtag #GrowDrumCorps, Ambassadors are already hard at work encouraging signups for the 2014 Ambassador program and drawing interest to the 2014 DCI Tour which will kick off this summer on June 18. Mailed Ambassador materials are currently limited to students in the United States, but DeNovi says that in the coming months, DCI will post a "digital toolbox" of materials that international students can use to help raise awareness for the 2014 Drum Corps International Tour. Learn more about the Ambassador program and register today.